Dave brought home a really lovely loaf of bread from the bakery. It was labeled Polynesian bread-I'm not sure what made it Polynesian, it was a little sweeter than normal white bread. I decided to make French toast stuffed with chocolate chips. I cut the bread into two one-inch slices and cut a little pocket in each slice of bread using a pairing knife. I filled the bread slices with chocolate chips, about a tablespoon for each slice. I mixed 3 eggs with a bit of milk, about 1/4 cup. I carefully soaked each slice of bread in the egg mixture, first one side and then the other. 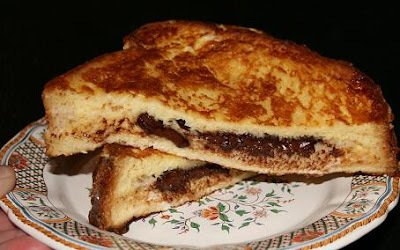 I fried the French bread in a little bit of oil in a skillet until the bread was browned and the chocolate melted. I served it with just a bit of powdered sugar. This was a really special Sunday breakfast! I really can't wait to try this! what a delicious breakfast!